Increases in wages are the only inflation, dontcha know? Management responds to wage inflation by cutting dollar production and then cutting productive capacity. It walks like a capital strike, talks like a capital strike, it must be a duck. Any time that management frets about not being able to hire enough workers, workers better be setting aside for the recession and layoffs. Fight off those economic drones that want to take away your income and/or livelihood! Another one of where to start? I want to argue that printing money does not, of itself, cause inflation. You could print trillions and have zero impact if no one is able to spend it, like buy bombs or something. And that would require congressional approval. Or maybe drop it around town from a helicopter. That will likely cause an inflation, but even that is not guaranteed unless you drop enough money to affect demand. 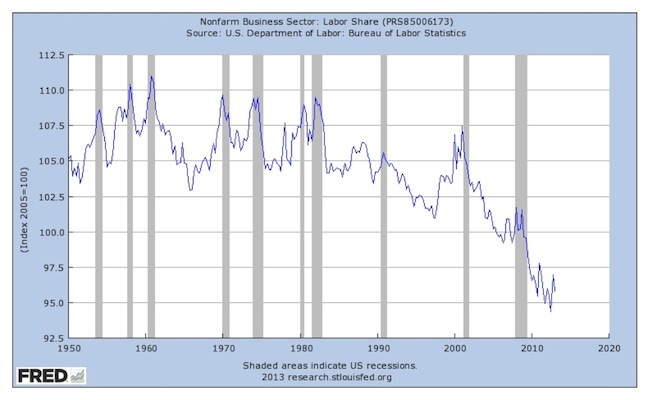 Increased employment, similarly, does not of itself cause inflation. When you get employment near full employment it certainly will do that. And you can cause inflation in any industry, like building tanks or bombs, if you spend too much money there beyond short run capacity. And that could spread. Wars tend to do that, ask the leaders of Weimar. Keynesian spending does not of itself cause inflation either. Deficits are not meaningful in a recession. If you have large deficits in full employment or near to it, you can expect an inflation. Inflation is also a different animal. A few years ago oil got to $147 a barrel and in the 70s oil increased dramatically. That sort of inflation is a supply shock caused by monopolists. It is something like a crop failure and increased food prices. That is why inflation numbers generally omit those two items. Nonetheless an increase there spreads to other items as well. I also think we need to beware of one time inflation and one that generates on going inflation. It is likely true that bankers will go bonkers over inflation, since their bets are often in fixed dollars. So too those living on fixed incomes. And Mickey D does not want an increased min wage since they may need to increase their prices a few cents. That one time inflation is something we should do. [… The source of the idea is a 1958 paper by William Phillips, showing an historical correlation between inflation and unemployment in the UK, and extended to US data by Paul Samuelson and Robert Solow. The correlation and the explanation worked together to persuade people that both the grounds of explanation and the relationship were more or less permanent features of the economy. The ideas behind the explanation are neoclassical, so the correlation served to validate those neoclassical ideas..
nowadays we have a surplus of trained labor and labor pools, aka factory towns, not just in the u.s. and europe, but all over the world – in china, india, indonesia, mexico, vietnam, …. wages and income in the u.s. have been stable or depressed for years. how do you get inflation under these circumstances? how could an intellectually honest economist claim you would? i would be inclined to argue, were i better educated in economics, that what inflation we now have is driven largely by market manipulation of commodities – electricity, oil, copper, beans, etc. – and by oligopolistic setting of artificially high prices to non-wealthy consumers – airlines, communications, etc. Where to begin? My head hurts. This is complete nonsense, all be it well within the confines of economic orthodoxy. I despair. ‘Growth’ is not going to save us. And my God, how can anyone say with a straight face that it is a dearth of money which plagues us. More money isn’t going to save us and since money is debt that means more debt isn’t going to save us. Of course economic orthodoxy never never every discusses debt, or money either. Bernanke himself allowed that the Fed does not use measures of money and credit to determine monetary policy. Try to get your mind around that. I’ll repeat, money is not considered when setting monetary policy. That said the Fed, whose business is money suffers from the law of instruments. Since their only tool is money they think money is the solution to everything, as in the guy with the hammer thinks everything is a nail. What Bernanke meant was monetary and credit aggregates, totals, are not included in their analysis. Rather they simply look at ever short term and make sure there is enough money, liquidity, in the financial system so it runs smoothly. Oh well, forgetaboutit. As it all come undone it will be perfectly obvious to future generations that ‘Economics’ was insanity, an ideology. We are at the tail end of a gigantic global bubble. From within its confines it seems reasonable that ‘growth’ can go on forever. Please try to peek from outside the bubble. Spend a few weeks here and try to begin to understand where we are. And please please please, do no try to impart partisan political understandings to these things. I don’t know what you mean by partisan politics. The democrats are just as hooked on neoliberalism as the republicans, and more effective at getting the will of the neoliberals done because of residual trust in the long-dead idea that the dems represent workers. The serious issue of partisan politics is us against neoliberals of both parties. RE Ed Walker and so RE orion, Right about neoliberalism and so right about partisanship, US style today. Talking not about rhetoric but about what is done, what happens. Democrats talk about inequality and Republicans decry the very idea that it is talked about, as per neoliberal teachings, but both deliver it. I am curious orion as to what partisan message you perceived in my post. I am truely at a loss as to what you perceive as partisan in that post. Not what you infer but what words you see that indicate partisanship. 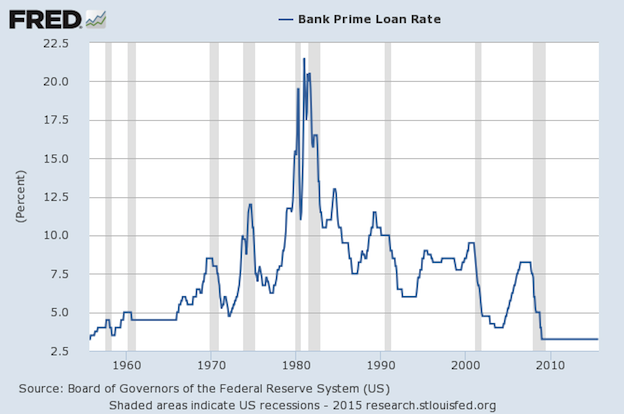 “… since money is debt that means more debt isn’t going to save us. Of course economic orthodoxy never never every discusses debt, or money either…”. why would you feel the need to use the word “partisan” in the context of this column on economics ? you’ll be lots happier (and closer to reality) if you can bring yourself to think of “money” as a lubricant to complex social organization rather than as “debt”. this particular edition of the creditbubble weblog is nothing if not partisan – ok, truthtelling in your view – featuring as it does the petersen institute and a propaganda conference it held, starring l. lindsey, r. fisher, and the deceitful republican political operative alan greenspan. your lack of self-awareness is comical. you clearly permit yourself to indulge in that which you forbid to all others. 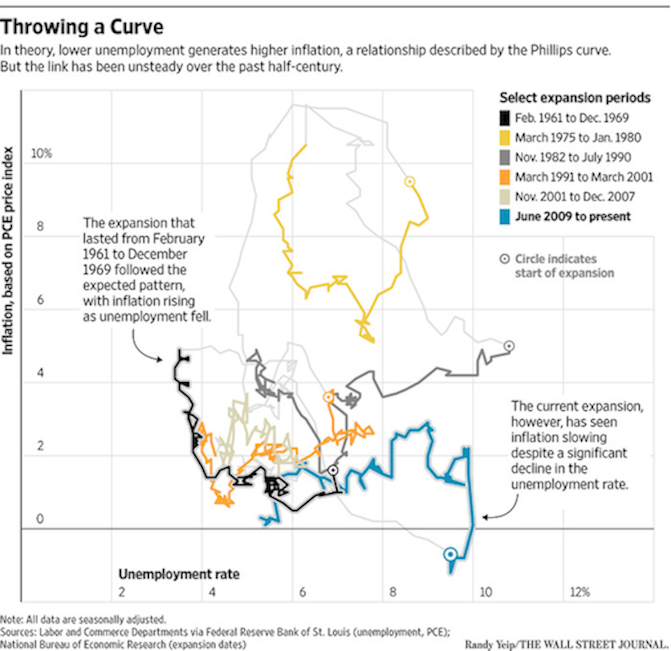 [… It would be extraordinarily useful to discover a specification of the Phillips curve that fits the data reliably. Unfortunately, researchers have repeatedly needed to modify the Phillips curve to fit new data. Friedman added expected inflation to the Samuelson-Solow specification. if memory serves, thomas kuhn’s book on paradigm shifts in science focused on the ptolemaic vs the copernican explanation for planetary motions. the ptolemaic was always in need of amendment or supplementation to account for events it’s central theory did not explain well. the (later) copernican system explained planetary motions with a simpler system because it was in tune with physical reality (with n. copernicus’ data-thebased insights into the relation of the sun and planets). it occurs to me that the perceived need among economists for perpetual jiggering with the phillips curve’s supporting data bears a close analogy to the ptolemaic system’s need for continual theoretical additions to account for discovered exceptions.